"Shattered Dreams" is an educational experience that reminds us all of the dangers associated with drinking and driving. It reminds us that too many young lives have already been lost and countless others severely impaired because of the tragic consequences of underage drinking and drinking combined with driving. "Shattered Dreams" is about drinking and driving. It's about living and dying. Can "Shattered Dreams" make a difference in a young person's life? Families, schools, faith-based and community groups in Texas must join together to teach young people that consuming alcohol while underage is never a good choice. Final exams will begin on Friday, May 24th and resume on Tuesday, May 28th after the Memorial Day holiday. 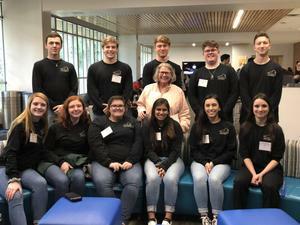 The Taylor High School Academic Decathlon team competed in the State Academic Decathlon competition in Frisco the first weekend of Spring Break and returned home as the State Small School Silver Medal Team. In addition, the team won the Silver Medal in the Super Quiz Oral Relay competition.